Well, it’s been a long time coming, but we finally got our Fibre-To-The-Cabinet hooked up yesterday. After some technical issues, chats with Plusnet and two very, very helpful BT engineers, we finally got connected. The different in speed was apparent immediately. I used www.speedtest.net to take two speed checks. One before the upgrade and one after. This is more than 10x faster, which makes me very happy indeed. The speed has actually gone down since yesterday, but Plusnet said it would take 48 hours for the speed to settle so by the weekend it should be fully speed! Arrghhh jealous of you now 🙂 . One day, perhaps in a few years time, BT will finally see their way clear to bringing FTTC to my home town. It took long enough to get it here in London! It was announced back in June I think but they kept pushing back the date! Hopefully they’ll keep up the pace. The more people that sign up the quicker they’ll roll it out! The Speed Test only shows you what you can get if the provider gives you all that they promise “up to”, basically what you are paying for. 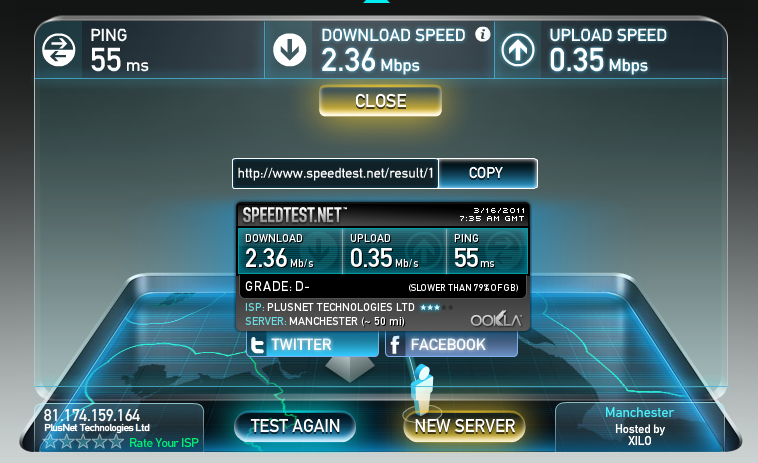 The Speed Test NEVER shows you actual bandwidth in real time. The Speed Test shows you what your infrastructure (line in – modem – router/firewall – LAN wiring) has the potential for, not what you are actually getting. But never fear there is a way to get this information, on a residential firewall/router costing between $15 – $250 dollars. Normally a feature reserved for devices costing closer to $3000.00 for commercial concerns. The three firmwares are DD-WRT, OpenWRT and Tomato. Tomato will cost you a little but is very well supported and worth it if you do not want to tinker with settings. DD-WRT and OpenWRT are free, extremely reliable, robust, full featured; however your device (firewall/router) must be a SUPPORTED device. Each open source project has a list of supported devices. Also you may have to be comfortable configuring from a terminal window or have a friend who is, FYI. Please oh please someone, anyone – using one of those three firmware products (all containing 24X7 bandwidth monitors) – post your upstream and downstream bandwidths…please. And yes I am jealous. My friends and I pay between $40.99(introductory rate) and $60.99 (per month and goes up every year) for “up to” 16Mb/2Mb but we rarely see above 300Kbps/40Kbps sustained. Only 1 second spikes higher…it reeks! I can force it to 1.5Mb/300Kbps if I get two downloads going and stream a third, but never when just watching a single streaming video. And the videos always skip, stop, etc… simply because they restrict the upstream bandwidth to below 300Kbps almost 99% of the time. I would estimate that my upstream bandwidth is below 100Kbps 90% of the time and below 30Kbps 80% of the time. I believe upstream bandwidth is the primary throttle to perpetuate the bandwidth scarcity myth and extort customers to pay more for a higher tier of service. (Note: A friend of mine upgraded his tier three times to the highest tier of service, yet even at the highest tier of Cable Internet service he said that he never gets upstream sustained above 40Kbps but he did notice his downstream opening up a bit…but not completely to the “up to” amount. He calls it FRAUD and I would not disagree with him. Every time streaming content sputters, skips, stops I feel like I am being abused by my cable provider. They don’t have to restrict me 24 X 7 as I know many of my neighbors are NOT online early in the AM and late, but they throttle bandwidth 24 hours a day, 7 days a week (24 X 7). Really makes you start to hate them all, Cable Internet Providers. 100% of cable Internet providers throttle, restrict, limit your upstream and downstream bandwidth, a sad fact. If you are not running commercial grade firmware (DD-WRT, OpenWRT, Tomato) on your inexpensive residential firewall/router than you are simply unaware of how badly your bandwidth is being throttled. Congrats on have the potential for 26Mb/8Mb… if you get a fraction of that sustained you are so much better off than most here in America! As for those saying you will have to wait 10 years, 15 years or 20 years… here in America there are almost 30 communities offering synchronous Fiber To The Home (FTTH) so we can move this year or next and do not have to wait for our providers to give us what they have been promising us for over 20 years. Look around in your country, you may have options that you are simply unaware of simply because you have not looked for them. Synchronous Fiber (same upstream as downstream, i.e 10Mb/10Mb; 15Mb/15Mb; 30Mb/30Mb; 50Mb/50Mb; 100Mb/100Mb, 1Gb/1Gb… if the second number is less than the first number your connection is NOT synchronous and you are guaranteed to be limited in multiple ways. No bandwidth caps (these are un-necessary and used to extort another $10+ per month out of you) It is telling that in 2006, they knew an average household would exceed 300Gb per month, yet all the caps they place are below that amount, usually 250Gb, with an extra 50Gb costing you $10…duh. Net Neutrality. There is no lawful or technical reason for anyone to censor, limit or restrict you. We are all adults, we can choose to live completely free (un-censored, un-limited) or to put filters on our individual LANs for our own families needs. We do not have to restrict our neighbors or anyone else outside of our households. The ability to run servers (Cloud, Mail, File, etc…) If you have synchronous FTTH, that entire pipe is available, the only limit should be what you are paying for. If you are paying for 10Mb/10Mb than any server in your home could use up a full 10Mb (per second) 24 hours a day, 7 days a week, all year long. FTTH does not impact your neighbor ever. More important technology has existed since 2006 that increases a single strand of glass (fiber) from 1 X to 1024 times …that’s a 1024% increase that is available to you at your home…all your provider has to do is swap out the fiber modem in your home…sometimes not even that as most modems are capable of the higher throughputs but are restricted in order to get you to pay more for more throughput (bandwidth). That is just a fact that many are NOT aware of. Yes you have been lied to for years. Remember that Japan had 100Mb/100Mb by the year 2000 for $55 per month; by 2006 Japanese consumers were getting 1Gb/1Gb for $52 per month…all the provider had to do was flip a software switch (in some cases swap out a fiber modem). Yes the price went down. This is NOT new technology, stand up for yourself, your family, your friends, your neighbors, everyone’s future and demand that your provider leave the dark ages behind and provide FTTH and if they refuse, either move or run for office and make it happen! They have had 20 years, why in the heck would you give them 5 more years much less 10, 15 or 20? Definition of insane, doing the same thing and expecting a different result. Are you being played for a fool? Where’s the Fiber? WTF? What is the minimum bandwidth upstream (and downstream) that should be allowed 99% of the time for your service to be considered BROADBAND? Think about it. Here in the USA we do not even get the FCC definition of 768Kbps for broadband…granted that bandwidth was too low as of the year 2000, much less 2011. Fiber to the home would indeed be impressive, but unfortunately that isn’t something that will arrive in the UK anytime soon. Whilst Japanese speeds are very impressive, I think there is something to be said for the population density. Japan is a little smaller than the state of California in size, but has about 1/3 the population of the USA. I know that in the UK, telephone companies still struggle with the idea of letting go of services like voice, even though they don’t make much money anymore! Broadband is beginning to become important here as a product in it’s own right. We have companies here pushing 100Mb connections, but the infrastructure is terrible so they can only roll it out in small pieces at a time. FTTP (Fibre to the Premises) is now catching on too and I don’t think it will be long before it becomes something they offer in the home. People have to *want* the speed for providers to actually see a demand and supply it. As we move to a more digital society (movie downloads, streaming music), people’s bandwidth demands will rise and so will the offerings of ISPs. Right now, they can get away with providing minimal service as people don’t really have a need or don’t complain enough. 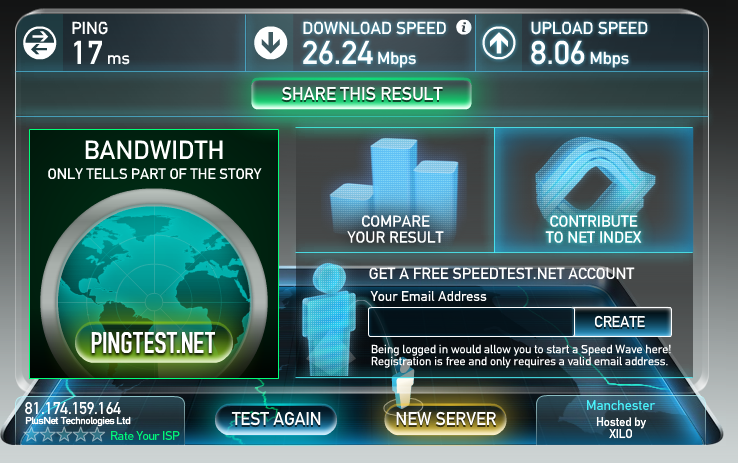 Right now, I’m pleased with my speed even thought I do suffer from traffic shaping. Thankfully, that doesn’t effect me too much!